Could this become a familiar sight in Columbus? Not sure how to start this post, or how to fill it. And finally, I don't really know how to wrap it up. All we know is, change is afoot in college football, and the conference landscape may be much different a week from now. Here's all the latest speculation wrapped up in one tidy little post. Basically, everything you read after this sentence is rumor and hearsay. • Boise State is fully expected to leave the WAC and join the Mountain West Conference this week. This may be the move that spurs all the rest. • Pac-10 officials, administrators and coaches met this weekend in San Francisco for their annual meetings. It has been speculated that they may be putting the finishing touches on invitations to half of the Big 12 (Texas, Texas A&M, Texas Tech, Oklahoma, Oklahoma State and Colorado or Baylor). No Big 12 schools nor the Pac-10 can admit this is officially happening, but none of them is denying it either. • If these invitations happen, it may be as soon as tomorrow...which would force the hand of Jim Delany and the Big Ten to expand. Most still expect the Big Ten to be eying Missouri and Nebraska, which make the most sense geographically. The Big East (UConn, Rutgers, Pitt, Syracuse) is still a major target for this Big Ten as well. • Notre Dame has remained suspiciously quiet during this latest round of speculation, which leads me to believe that either they're trying to remain independent, or the rest of the college football world just knows to leave the Irish alone. The only conference that makes sense for the South Benders is the Big Ten, so until Delany rings up the Irish chancellors, no one else will be beating down their door. • Clearly, the major player in any conference realignment equation is Texas. If they leave the Big 12, whomever woos the Longhorns will also have to inherit Texas A&M and Texas Tech as well (and maybe even Baylor...it's a deal the Texas schools created to remain forever linked...it's actually a law). 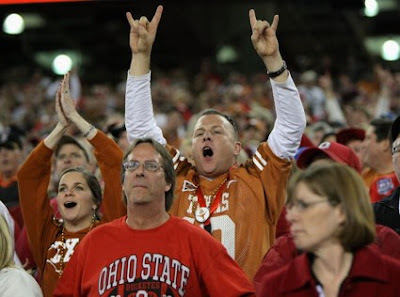 In both the Texas to Big Ten and Texas to Pac-10 formulas, each would have its own geographical problems. For football, it makes sense to travel so far to play, but for the smaller sports (swimming, softball, indoor track, etc) it creates a huge inconvenience for those student-athletes to trek halfway across the country so many times a year. Clearly this all comes down to money. The Big Ten Network is the reason this is all happening. Each Big Ten school gets roughly $20 million a year from the network, which is one-of-a-kind for college sports. The Pac-10 is hastily trying to develop the idea of creating it's own conference network in order to begin a similar revenue stream for it's own schools. I'll give you one reason why a Pac-10 Network will not be as successful as the Big Ten Network: The Big Ten schools (or mid-west schools in general) have large alumni bases that graduate and move to either Chicago, the southwest, or the coasts, typically the east coast. This creates a large number of viewers in major TV markets. The Pac-10 has smaller alumni groups that graduate, and typically stay on the west coast. The Pac-10 plays it's prime-time games at 10-11PM eastern time. No one on the east coast who didn't go to a Pac-10 school is going to watch those games. The hypothetical Pac-10 Network may be successful, but will it generate enough revenue to doll out $20 million to 16 schools every year? Not likely, at least at not as easily as the Big Ten Network can. All we know is we don't know anything. This is going to be a crazy week for the conference realignment hype-machine. Things may get nuts as soon as tomorrow...or, things may fizzle out and we won't hear anything until the season starts. All I know is, whatever we find out, we'll let you know.